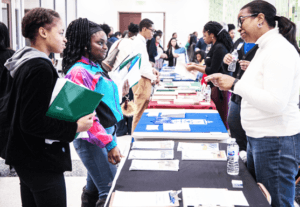 100 Black Men Deliver “On the Spot” Scholarships at Annual College Fair – 100 Black Men of America, Inc. The 100 Black Men of Jacksonville, Inc. (J100) hosted their 14th Annual Infinite Scholars College Fair, January 20, 2018 at the Jessie Ball DuPont Center. This event featured about 30 National, Regional and local colleges and universities that included various historically black colleges and universities (HBCU’s). About 500 students and parents participated as approximately $2.1 million in admissions and scholarships were awarded.